The legacy of the Staffordshire Potteries is extraordinary and certainly includes Carlton Ware. Close to Carlton Ware's Copeland Street works was the former Minton Hollins Tile Works. The factory, in Shelton Old Road, was largely demolished in 1987 but the main building, facing the street still survives. It has been renovated and like the Carlton Works has a new use, in this case as offices. Minton Hollins & Co. is well known for its encaustic or inlaid floor tiles used in many public buildings during the Victorian period. The reason for writing this article was to let you know that in April 2017 it was possible to view the Minton Hollins tiled pavement at St George's Hall in Liverpool, which, from 1860 to the present day is usually covered over with timber to allow dancing and other events to take place. When it was laid it was the largest in the world. Below is a picture showing the scale and grandeur of the pavement. The Palace of Westminster, US Capitol, Victoria & Albert Museum and many other prestigious buildings used Minton Hollins & Co.'s encaustic tiles. 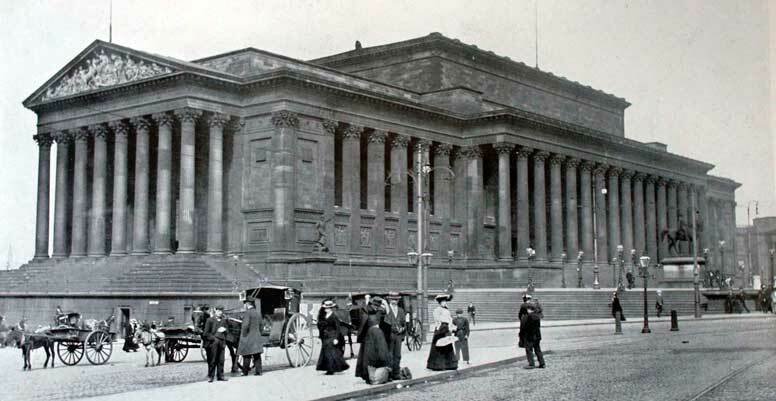 In 1969, the architectural historian Nikolaus Pevsner expressed his opinion that St George's Hall is one of the finest neo-Grecian buildings in the world. Below is a photograph taken in 1904.